SAINT-QUENTIN-EN-YVELINES, France (AP) — They booooooo-ed the Americans. They chanted the names of their European heroes. Once again, this time on a warm French morning, the vast Ryder Cup crowds that massed to witness the first shots provided a spectacle unlike any other in sports. Otherwise perfectly sensible adults donned silly hats and costumes, breakfasted on beer and sang their hearts out. A wall of noise, whistles, cheers, chants, jeers and encouragement cascaded down the monster grandstand. 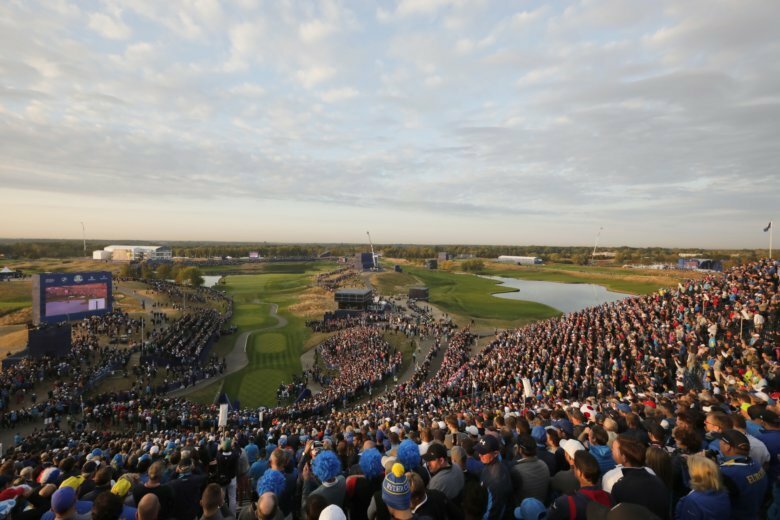 It has 6,928 seats, making it the largest first-tee grandstand ever at a Ryder Cup. But most of the spectators were so pumped-up that they stood. Thousands more people crammed stands and hillocks overlooking the tee, making the players look tiny, like ants in a giant’s hand, in the middle of the roiling human sea. The feverish, pressure-cooker atmosphere all seemed a bit too much for Ryder Cup rookie Tony Finau, who hit the first shot at Le Golf National and overcooked it. European fans cheered loudly when his 3-iron off the tee landed right at the edge of the water at No. 1, leading to a bogey. Fans cheered again, chanting his name, when Justin Rose’s second shot plopped sweetly about 3 feet from the cup. His birdie putt then gave Europe an early lead. But the crowds, although boisterous, were also respectful, playful and not nasty in their teasing of the visiting Americans. For Finau’s opening shot, the silence was absolute, impressive from a crowd so large. “One of the best experiences ever, once in a lifetime,” said Brian Dwane, an Irish fan dressed in European blue and yellow, with a cape and padded top that gave him chest muscles like a superhero’s. “Bananaman,” the 44-year-old Dwane deadpanned, describing his costume.